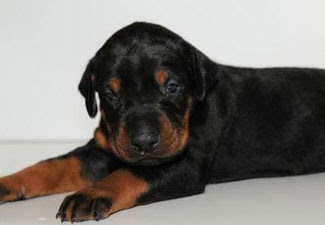 Breed Group: Working Weight: 33 kgs Height: 69 cms Color(s): black, red, blue, and fawn, all with tan markings Coat: The coat of the Doberman Pinscher is thick, smooth, short, hard, and close-fitting. The color of the coat comes in fawn, red, blue, black and tank, and black. There are typically rust colored markings above the eyes, on the muzzle, throat, legs, feet, chest, and below the tail. Character: Muscular, elegant, and graceful, the Doberman Pinscher is medium to large in size. This breed is courageous, resourceful, bold, and highly intelligent. They are one of the most respected and popular dog breeds; known for their deep devotion and protective nature. Temperament: Versatile, fearless, and assertive, the Doberman Pinscher thrives on human companionship and stimulation. They are exceedingly loyal and protective of their family and home. This breed does best with older, well-behaved, and considerate children. They do not typically get along well with other household pets. They are aloof and reserved with strangers and make excellent guard dogs. This people oriented breed may closely bond to one particular family member. Activity: Highly energetic, Doberman Pinschers require daily extensive exercise and stimulation. They enjoy family play sessions and make wonderful walking companions. This breed will do okay in an apartment provided they are sufficiently exercised. However, a securely fenced yard is best for romping and running freely.